Hairy crab, or the Chinese mitten crab, is the great autumn delicacy of eastern China. It’s sometimes called in Mandarin dàzháxiè, particularly those from Yangcheng Lake. Until December 31, 2016, Si Ji Xuan at Four Seasons Hotel Shanghai is serving extremely fresh and sweet hairy crab from the famous Yangcheng Lake. No matter what kind of cooking methods one likes – steamed, braised or stir-fried – Chef Wayne Wang offers something for everyone in his extensive hairy crab a la-carte menu. 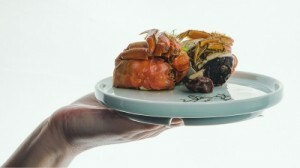 Classic crab dishes include hairy crab with spinach rice skin roll; traditional “drunk” baby hairy crab; baby crab with salty pork, eel and chicken broth; baby crab with organic taro; hairy crab stick with euryale ferox and fungus; wok-fried crab meat with yam; crab meat pork wonton; and steamed Yangcheng River hairy crab. For those who don’t want to work hard for their hairy crab, Si Ji Xuan’s crab specialist will be on hand to wow guests with his hairy crab cracking show. Steamed hairy crab with cracking service is CNY 318 plus 15 percent service charge.